← 388 "The Wife Aquatic"
The Simpsons climb onto the couch as babies, but quickly grow up into their proper ages. "Revenge is a Dish Best Served Three Times" is the eleventh episode of the eighteenth season. This is one of several Simpsons episodes which are considered anthology episodes that features mini-stories. "After the Simpsons' car breaks down, the family tells each other tales of revenge gone wrong. Marge offers a cautionary tale of revenge from 19th-century France, where Homer is charged with treason; Lisa tells of a nerd revenge at Springfield Elementary involving Milhouse leading the nerds to overthrow the bullies; and Bart's story follows the great crime-fighter Red Revenge"
After the Simpsons' car is cut off by the Rich Texan, Homer's lust for revenge prompts his family to tell three stories of vengeance, hoping to convince Homer that pursuing revenge is not a good idea. Marge offers a cautionary tale of revenge from Nineteenth-Century France, based on Alexandre Dumas's The Count of Monte Cristo. Moe breaks up Homer and Marge's marriage by framing Homer as an English traitor. When Moe marries Marge, Homer, now in a French prison, swears revenge. His cellmate, Mr. Burns, tells him to find treasure through a tunnel he dug. Homer finds the riches and becomes the Count of Monte Cristo. Five years later, Homer invites Moe and Marge to a party at his mansion, where Homer kills Moe in a home-made revenge machine. However, Marge angrily rebuffs him for killing Moe because wihtout him who will take care of her triplets? Back at the present, Marge tells Homer that revenge can lead to misery, but finds that Homer has been listening to a Jamaican music station instead of her story. When she tries to remind him, Homer brings out his bat and yells "Revenge!" Homer also claims that he shot Mr. Burns and placed the blame on Maggie, although this is most likely a joke by the writers. Lisa's story revolves around Milhouse's campaign to fight back against the school bullies, and the consequences when he goes too far. Tired of being bullied by Jimbo, Dolph and Kearney, the geeks plan their revenge. In the science lab, Martin reveals his latest creation, The Getbackinator, an awesome weapon of mass destruction. Milhouse -- the only geek with any hand-eye coordination to shoot the weapon -- uses it on the bullies, which give them wedgies and purple nurples, and forces them to eat ear mucus and hit themselves in the face. But the deranged Milhouse then begins attacking anyone who has ever wronged him, including Martin (for accidentally hitting him with a shuttlecock), Richard (for being more popular with girls), and Wendell (for giving him "Chinese cuts" in the lunch line). Milhouse even shoots a kid who had never done anything to him, claiming it is "prevenge". Milhouse gives Groundskeeper Willie an Ultimate Noogie which decapitates Willie. Lisa tells Milhouse he has become addicted to revenge. He initially acts as though he were going to attack her with the device but realizes he could never hurt her. He removes the device and tosses it to the ground. Nelson then appears having been absent due to the mumps, picks up and attaches the weapon and turns it on Milhouse. Homer likes the story because it has what he likes in a story — an ending. Lisa says the moral is that revenge can make you as bad as the person who harms you. 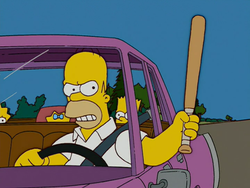 Homer argues the moral should be to "never let go of your weapon". Bart recounts Bartman's "origin story", based on Batman's origin as revealed in the film Batman Begins. After leaving the Gotham City Opera House, Homer and Marge are killed by Snake Jailbird in a dark alley. Homer pleads Bart to avenge him in "a flamboyant, impractical fashion". Bart does as his father says and swears revenge on Snake, giving birth to his superhero ego, Bartman with the help of his grandpa. He flies around Gotham City, defeating enemies on his way for justice they are The Diddler, Mr. Mole, Sugar and Spice and Poison Lenny. When Serpent, Snake's alter ego, attempts to steal the "Stealable Jewels of the Orient" from the Gotham Natural History Museum, Bartman arrives, saves the Jewels, and kills Serpent by impaling him on the fangs of a snake statue. In the end, a reporter (played by Lisa), reminds Bartman that the Serpent's death will not revive his parents. Bartman agrees, but adds that he now feels better and has gained zillions of dollars and freedom from his parents, then goes home to his mansion to exercise while being fawned over by a beautiful woman. Unlike the first two segments, this story implies revenge is satisfying; nevertheless, while Bart was telling the story Homer reconciled with the Rich Texan after discovering they are both from Connecticut. At the end, the screen reads "Dedicated to all who died in the Star Wars films". The list includes: Darth Vader, Darth Maul, Greedo, Uncle Owen, Storm Trooper #5, Jango Fett, General Grievous (Droid), Storm Trooper #22, Ralter, Dak, Obi Wan (Ben) Kenobi, "Whoever Jimmy Smits Played", Bail Organa, Jabba the Hutt, Sy Snootles, "Unfortunately, not Jar Jar Binks," and "everyone on both Death Stars when they blew up".